Our thoughts have been of Stephanie and Chris and the family. Thursday morning (June 25th) we were at Zone Conference in the Bayanzurkh building. We knew it was the same time (June 24th in Utah) as Stephanie was receiving her endowments in the Bountiful Temple. We were thinking of her. The theme of the conference was the grace of Jesus Christ and happiness. Through the atonement of Jesus Christ we are strengthened that we might do good works and be worthy of eternal life. But it is not just eternal life as individuals we seek, it is eternal life as families. We love our family and want to be with them forever. Stephanie and Chris were married at 11 am on Friday June 26th in the Mt. 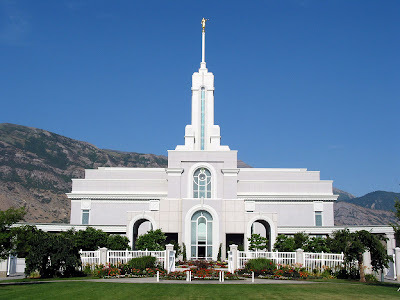 Timpanogos Temple. Again our thoughts were with them. We imagined where they would be and what they would be doing at a given time. We were so happy that our family and Chris' family were with them in the temple. Later on Saturday morning our time (Friday night their time) Wes was able to talk to Stephanie on the telephone during her reception. We wish them an eternity of happiness. 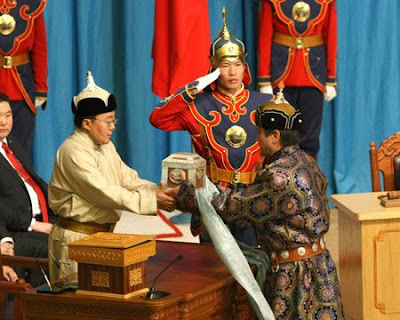 On Thursday June 18th the new Mongolian president Elbegdorj was sworn in with a ceremony at Sukhbaatar Square here in Ulaanbaatar (http://english.sina.com/world/p/2009/0618/249442.html). Since the day following the inauguration, we have not had hot water. I know there's no relationship, but that means including today we've had 10 days of only cold water. We're grateful for our large Philips electric tea kettle (it holds about 4 liters, more than a gallon); it does a good job of producing hot water. In fact if we boil water in the morning, the water is still warm at lunch time. The girls Odmaa and Saran who wanted missionary lessons are taking the discussions with their mother. The sisters who are teaching them are excited about teaching them and having them as investigators. The elders still have not contacted our doctor Bolormaa, but we took the doctor both an English and a Mongolian Book of Mormon. Last Monday at Sukhbaatar we conducted the recreational activities in the parking lot after the young singles home evening lesson. We played Land-Sea, Red Light - Green Light, and soccer. Saturday morning I taught the two group piano classes since Sister Anderson wasn't able to teach them. In the evening we attended the National Theater with Gloria Wheeler who is leaving Mongolia soon and with her sister. This was the second time to see the performance here, and it was very good. Afterward we ate dinner at an Italian restaurant. There were quite a few Americans at the restaurant. I thought what a contrast between eating there and the everyday lives of the people here. Last Monday evening we were invited to attend a home evening at the home of Battsagaan in Sukhbaatar. It was very enjoyable. There were about 6 of his friends who are now members also there. 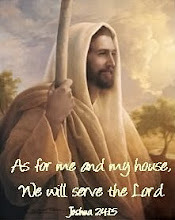 You could feel the spirit of the gospel in his home. They live in a ger during the winter. They had taken it down for the summer and were living in a one-room shack. As I sat there, I thought here is a home of Zion in this one-room home far out here in Mongolia. This week we had three opportunities to talk to people about learning more about the gospel. For our Thursday class at the hospital we only had one doctor in the class, Doctor Bolormaa, a neurologist. We talked to her in English for an hour. She said she had a Christian book in English, but she couldn’t understand it (I think it was the New Testament). We asked if she wanted someone to teach her about it. She said yes. Since she lives in the Khan-uul district, we called Elders Neumann and Ray and gave them her phone number so they could teach her. We will bring her an English and Mongolian Book of Mormon to class Tuesday if she doesn’t already have them by then. She wanted an American elder to teach her. Hopefully she is interested in learning about the gospel, not just in learning English. Upon our leaving the hospital, a doctor (we think) spoke to us and said she wanted to bring her daughter and come to our church. She asked and we gave her the times of the meetings at Bayanzurkh. We were not successful in getting her name and phone number. We went to the Bayanzurkh building to meetings today to look for her, but we didn’t see her. Saturday after the piano class, when I was going up in the elevator, two young girls Odmaa and Saran ages 15 and 13, who had been in the piano class, got my attention and told me in English they like the Church and want to join. (Later I discovered that Sister Andersen had told the students in the piano class that if they were not members, she wanted them to take the missionary discussions.) I don’t know if this influenced them or not. I took them up to the mission office looking for missionaries. I asked Elder Bayasgalan and his companion if they could teach them right then. They said they couldn't because the girls didn't live in their district, but the elders called the training sisters and an appointment was made for the training sisters to teach the girls. Our English classes at Bayanzurkh have about 45 young people in attendance each time. We really enjoy these classes. We’ve been trying to find a way to keep teaching these classes and also attend the Addiction Recovery program, but this may not work. My new assignment when the Hitchmoughs leave at the end of July is to be in charge of the Addiction Recovery program. Saturday evening was a senior social in the basement of Bayanzurkh in honor of the fathers for Father's Day. We watched a short video clip on fathers, played dominoes, the men played pool (yes the Bayanzurkh building has a pool time which they carefully guard), and of course ate goodies. Sunday, Father's Day, we invited Gloria Wheeler over for dinner. Dinner was made by Dad even though it was Father's Day. He made beef stew in the crockpot, and we had homemade bread which he'd made Saturday. I added a peach crisp with ice cream. This past week has been a busy week in the office. 17 new Mongolian missionaries came into the mission office this week and received orientation to prepare them to attend the Manila Philippines MTC. They flew to the Philippines on Friday. They will return to Mongolia on July 3rd to serve their missions here in Mongolia. 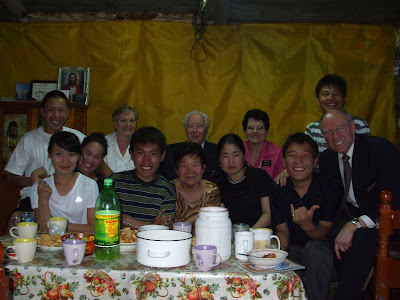 A few Mongolians serve missions in Korea, Australia, Russia, or the United States, but most of them serve in Mongolia. There is a problem in their getting visas to other countries. Saturday night we invited the Caldwells to our apartment for dinner. I bought beef for the first time in the form of ground beef and made a ground beef and vegetable casserole. Wes made a loaf of homemade bread (we have one long bread pan). For dessert we had apple crisp. Then we played All Fives Dominoes. This version of dominoes is popular with the senior couples in Ulaanbaatar. The day before, two senior couples, the Caldwells and Dr. and Sister Anderson, were invited to visit a ger further out from the city. I think you'll be interested in reading about their experience and seeing their pictures at http://mikeandmelba.blogspot.com/2009/06/countryside.html and http://mikeandmelba.blogspot.com/2009/06/countryside-part-2.html and http://mikeandmelba.blogspot.com/2009/06/countryside-conclusion.html. 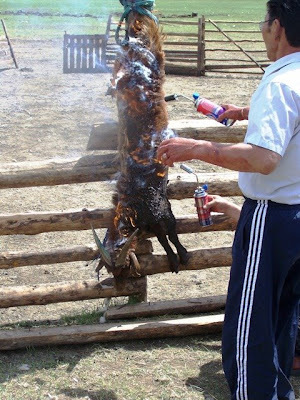 What follows is a picture from their blog of the goat they were served for dinner. Bonnie, show this website to Greg. This weekend (June 6th and 7th) was the Mongolia Ulaanbaatar District conference. The presiding authorities at the district conference were Elder Hallstrom of the Asia Area presidency and a member of the 1st Quorum of 70 and Elder Jones (from Taiwan) of the 8th Quorum of Seventy. The conference began with a priesthood leadership meeting at 4 pm which Dad attended, followed by an adult session at 6 pm. Elder Hallstrom spoke about priesthood keys. Talks emphasized how sometimes people are called, and sometimes they’re released. He asked the members to pray so that on Sunday they would be prepared for the changes, feel the Spirit and know the changes are Heavenly Father’s will, and have a spirit of unity. One theme of Saturday and Sunday conference talks was the importance of families. Families are the basic unit of the church. The church supports families and enables the organization of families throughout the generations. Sister Andersen remarked having the TV on does not build loving families. Sunday there were many changes as part of the organization of the first Mongolian stake. First they divided the previous Mongolian Ulaanbaatar District into the Mongolian Ulaanbaatar East District and the Mongolian Ulaanbaatar West Stake with six branches in the district and six wards in the stake. The previous district presidency was released. I’m not sure who else was released because I missed it in the translation. Then the new district presidency was sustained by those who will be in the new district. The previous president of the Mongolian Ulaanbaatar District, President Odgerel, is now the president of the Mongolian Ulaanbaatar West Stake. They gave the names of his new counselors and the stake high council and the names of the bishops for the new wards. They all were presented to become high priests since there were none before the organization of the stake today. Elder Hallstrom spoke about a stake patriarch being calling which they have anxiously awaited. He told the people they needed to be patient since the new stake president will need to submit a recommendation to the Quorum of the Twelve. He added that even after a stake patriarch is called they will still need to have patience. It will take many, many months to provide patriarchal blessings to all the members in the country of Mongolia who desire a blessing. Elder Hallstrom emphasized all are alike unto the Lord, both those in the stake and those in the district. The members need to build up the church so the district can also become a stake in time. Again Elder Hallstrom explained to the members the differences with having a stake president. Instead of the mission president, the stake president will interview for temple recommends, set apart missionaries, administer Church discipline for members of the stake. He is the presiding high priest of the stake and holds the priesthood keys. Several references were made to focusing on the ordinances of the gospel and the covenants we have made in connection with the ordinances. As we focus on ordianances, we will grow closer and closer to God. We need to spend our entire lives keeping our covenants. One of the outstanding features of both the Saturday evening and Sunday morning sessions of the conference was the choir music. The singing was beautiful. The director of the choir is a woman who is a professional choir director. The choir sang before and after the sessions as well as performing musical numbers during the meetings. On Sunday morning a young girl played a cello along with the choir and congregational musical numbers. Friday morning we attended the dedication of a well built by Deseret International Charities. The well was turned over to the governmental district. As I understand, the Church has built hundreds of wells throughout Asia to help the people. For the people to get water at a private well, the cost is 40 cents per liter; at the new well the cost will be 2 cents per liter. That is a big difference considering that water is needed for washing and cleaning as well as for drinking and cooking. Friday evening we attended a baptism at Sukhbaatar where two people were baptized. Wednesday (June 3rd) was our 46th wedding anniversary. We went to a Chinese restaurant and ate dinner with the Clarks. The food was very good. Monday (June 1st) was Children’s Day in Mongolia which is a national holiday. Sister Andersen, the mission president’s wife, invited the sister missionaries in the area to come to the Bayanzurkh building for demonstrations on baking cakes. Most of the Mongolian sisters have never baked a cake before because not all homes have ovens. It was a fun get together for the sister missionaries. Monday evening we attended family home evening for the young single adults at Sukhbaatar. For the lesson several of them gave short talks on scriptures and bore their testimonies. Afterwards we went into the parking lot where they played tug of war, skipping robe, and then soccer. This is a picture of Hospital 2 where we teach English to doctors.